Is your pool table unlevel? You may have a wedge thief in your midst. Here in the showroom we have about a dozen or so pool tables setup on the floor for our customers to view and roll balls on before they purchase. Each pool table is setup and leveled so that the balls will roll straight. Quite recently I’ve noticed our three year old son playing with some wood wedges while here at work. Our repair workshop is attached to the showroom so I assumed he was foraging around looking for something to play with in there. I was wrong. 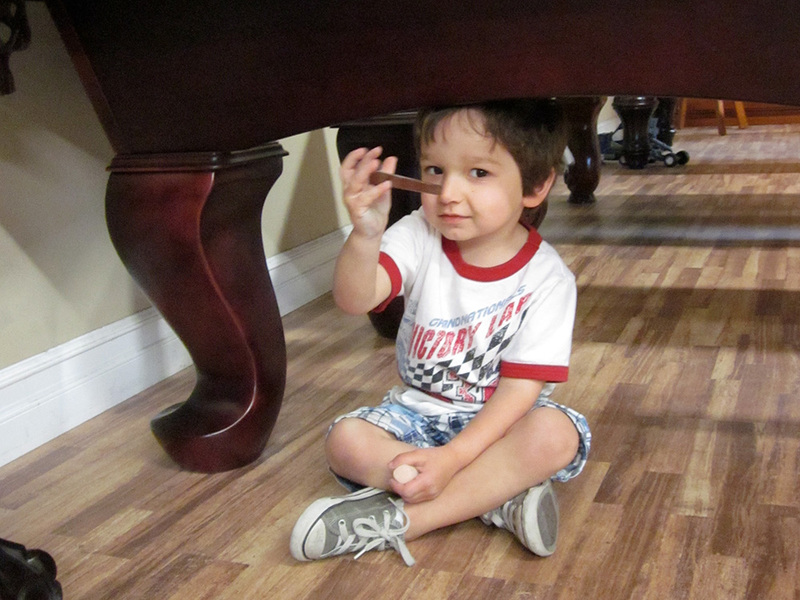 He has been climbing up under the display pool tables and yanking the wood wedges that tweak the level of the slates. Grrrr! I mention this not only because it irritates me as a mom, but because it is the second-most common reason we are called on to relevel a pool table. So be on the look-out for your very own wedge bandit to keep you from having to call us for a minor relevel.